The alternative for Kheir, 5, was gathering plastic and nylon from the sides of the road and then selling them to the local buyers who are interested in recycling. As for Mhamad, 6, it was collecting potatoes from the field for hours and hours every day. But thanks to determined parents and World Vision’s “Early Children Education” program, both boys were introduced to the world of education. “He’s the only one in the family who stands the chance of having a good future. All of our hopes are pinned on Kheir,” said his mother Souraya, 37. None of his eight older siblings had the chance of receiving schooling, neither in Syria nor in Lebanon. Kheir comes from a big family. His father remarried and had children from his second wife. He no longer supported Souraya’s children, who are all minors, especially after both families fled to Lebanon from Aleppo in 2011. Souraya heard about World Vision’s “Early Children Education” program, which is based on activities that give vulnerable children the opportunity to be successful in life. It develops their skills and hobbies through a curriculum for children ages 3 to 6 that includes learning letters, sounds, colors, songs, and numbers. The classes take place in seven different informal tented settlements in the Bekaa area. Souraya registered Kheir, as he was within the correct age range. But Kheir’s older brothers had to gather plastic and sell it in order for their family to survive. They often asked Kheir for his assistance in certain neighborhoods. 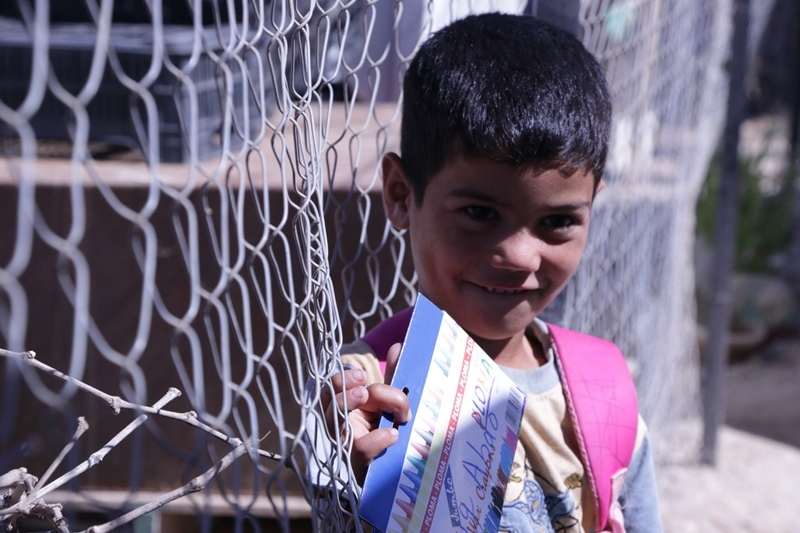 “He begs me to go to school instead of work, because he likes it there more,” said Souraya. “I make $7 on most days. I use it to buy bread and water for my family,” said Kheir, who has asked his brothers if he can work with them after school, so he doesn’t miss classes. “The school is like a sanctuary to him and I encourage that,” said Souraya.